Presidential spokesman George Charamba has for the first time given insights into some of the factors that contributed to the frosty relationship between former president Robert Mugabe and his war time colleagues. In his last days in office, Mugabe had been cut off from the old guard in Zanu PF, and put on a short leash by members of the Generation 40 (G40) faction, which drew clout from former first lady, Grace. Charamba, who served as Mugabe’s spokesperson and has continued with the same duties under President Emmerson Mnangagwa, spoke of how perceived foes of the first lady were denied recognition even when they clearly deserved it. He narrated how the concept of a memorial institution for Mugabe was presented to the nation as if it was a product of former Higher and Tertiary Education minister Jonathan Moyo when it was, in fact, conceived by Mnangagwa. Moyo broke the news in August that government had approved the idea of establishing a university named after Mugabe at a cost of $1 billion. He said the institution would concentrate on science, technology and engineering and would also have a research institute. On Wednesday, Charamba lifted the lid on what had happened behind the scenes. He said he was privileged to have been part of a meeting convened by the then vice president (VP) to discuss the concept and the architectural drawings done by architect, Joel Biggie Matiza. The meeting was also attended by General Constantino Chiwenga, of the Zimbabwe Defence Forces. “The first time I saw it was when he (Mnangagwa) invited me and army general Chiwenga to look not only at the concept of it but also the drawings of that institute, which papers ED — then as a vice president — had discussed with the former president Mugabe,” said Charamba. “It was at that meeting, where I was wearing my hat as an academic, suggested that to create an institution that was dominated with the notion of museum would freeze RG Mugabe yet RG Mugabe was much more than legacy. He is a continuing set of ideas that must not only shape the present but must also be imparted to the future — making him a living force by asserting and elaborating his ideas. That evening, the concept was revised to incorporate a university element,” he added. At that meeting, it was suggested that Mnangagwa was to engage Grace so that she becomes part of the project. Charamba had reasoned at the time that by bringing Grace into the project, it would help mend the fence between the former first lady and Mnangagwa. Relations between Grace and Mnangagwa had started to deteriorate, with the former first lady using public platforms to humiliate the man who had lived in her husband’s shadows for nearly six decades. She accused Mnangagwa of plotting to unseat Mugabe — an allegation that has since come to pass. Charamba also became the target of her insults due to her closeness to Mnangagwa. Cap in hand, he was publicly humiliated by Grace at a rally in Chinhoyi for being an accessory of Mnangagwa’s Team Lacoste faction that did not see eye-to-eye with G40 over Mugabe’s succession. Charamba narrated how he tried to have Mnangagwa and Grace smoke a peace pipe with his effort coming to naught after the university project was handed to Moyo to run with. “I knew that she (Grace) had envisaged an orphanage that would morph into a primary school, then a high school and ultimately a tertiary institution. That was before the concept of an RG university came. So I had that in my mind and said to the then vice president, shefu Amai had the same idea, and given the bad blood that was already evident between the two I counselled that it was wise for the then vice president to take his proposal at the formative stage to the first lady so that he would not be seen to be excluding her from plans that sought to consolidate the legacy of the then president who, after all, was her husband,” said Charamba. “At the back of my mind, I was mindful of two things. One, my deteriorating relations with the then first lady, based on a misconception which she had developed that I did not respect her and she narrowly interpreted my mission as the communications officer to cover the then president while excluding her,” he said. “My second calculation was in fulfilment of my role as a public relations officer. Realising the growing estrangement between the then VP and the first lady, which seemed to gather fury with every interface rally, my calculation was such a good gesture, which the then VP had thought voluntarily and invested so heavily at a personal level as a sign of goodwill to the then first family,” he added. “…What I cannot say with certainty is when the former vice president then approached the then first lady with the drawings, I think the drawings were done by (former Mashonaland East provincial minister Joel Biggie) Matiza and the horror, the horror, I later read and heard that chinhu chiya chatorwa (it had been taken away) from the then vice president chikapihwa Jonathan to mind which, by the way, could still have been correct to the extent that Professor Moyo was still the minister of Higher and Tertiary Education, except what I could not understand the expunging of ED’s role in this whole project on the one hand and the exaggerated extolling of a late comer in the project. “I got to know about this strange outcome through Cabinet minutes when I read that Jonathan Moyo had made the presentation making the then vice president a guest in a project he had started. My efforts at restoring communication between the two had backfired,” said Charamba. Interestingly, Grace has also previously lashed out at Mnangagwa for taking her ideas and presenting them to the nation as if they were his. She claimed at one of the youth interface rallies that she was the brainchild of the Command Agriculture programme, profiled as one of the signature projects of Mnangagwa. On Wednesday, Charamba also revealed that the 21st February Movement musical galas had to be stopped for fear of creating another platform that would have been used by the former first lady to create divisions in the party. “We stopped the commemorations because Ambuya vaka complainer. I could see the same being used against the VP,” said Charamba. The presidential spokesman also revealed how Grace and her allies also gate crashed into the writing of Mugabe’s biography. He said following the death of former Information minister Nathan Shamuyarira in June 2014, a decision was made to resuscitate the writing of Mugabe’s biography under the management of historian, Phyllis Johnson. “Then one fateful day that project was rudely taken from her, and I use the word rudely advisably. You should have seen the poor woman, she just got a sharp plain instruction kuti dzosa, and who was going to do that it was again Jonathan,” said Charamba. He said these incidents gave him the impression that Mugabe’s legacy had morphed from being the business of Zanu PF to that of a few individuals around his wife, Grace. He said Mugabe had become a captive of the Generation faction now scattered across the world in the wake of his fall. “So looking at these seemingly unrelated matters, I got a distinct impression that the then president’s legacy had ceased to be a matter for his party, Zanu PF but for preferred members working with the first family — it was a family affair,” he said. “If you consider that vakuru had picked Shamuyarira (to write the biography), you notice it was not just a choice based on his attributes but it was a gesture of symbolically surrendering his life and legacy to the party he had served and led, after all his life and legacy was to a large measure the life and legacy of the party, which is why it could only be written by the spokesperson of the party in the form of Shamuyarira. 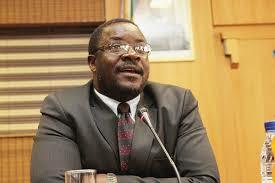 This was a classical case where competence and loyalty coincided,” said Charamba.